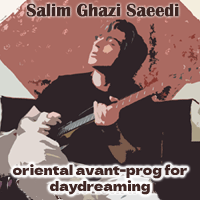 It may seem unreal at times, this set of compositions float like thick lava, and on rare occasions sprew thunderous bursts out of gorgeous sparse meditative voice. It also may begin wth soothing gamelan bells, move to solitary piano strokes like Erik Satie , haunting strings, nature sounds, hymnal vocal pieces, oriental prayer-like moments, all with a classical seriousness. If you are willing to listen in a totally devoted way, then this all will not be wasted. If I only had one word to describe, it would be cerebral. This was recorded live over a four day period at the Petit Faucheux tour. There are three movements that contain a varied number of titles which are either direct lines, or paraphrased/rearranged/modified words from a beautiful and striking poem by Fernando Pessoa called ‘The Keeper of Sheep’. Conducted by Baptiste Bouquin, this thirteen piece ensemble includes Julien PONTVIANNE (clarinet, saxophone, composition), Antonin TRI HOANG (clarinet, saxophone), Jean-Brice GODET (clarinet, cassettes), Jozef DUMOULIN (piano), Tony PAELEMAN (fender Rhodes), Richard COMTE (guitar), Amélie GROULD (vibraphone), Stephane Garin (percussions, gamelan), Julien LOUTELIER (percussions, gamelan), Youen CADIOU (double bass), Simon TAILLEU (double bass), Ellen Giacone (voice), and Alexandre HERER (electronics). While 98% of the material is ceremonial with clarity and a calming effect, the music is not void of quick twists and exploration that seems to always be occurring. 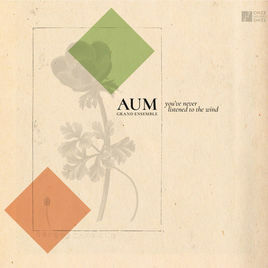 With each ghostly off the path action Aum Grand Ensemble take, the fleeting music returns to a spiritual place. ‘You’ve Never Listened to the Wind’ is a set of twinkling works that are full of luster and have a beautiful oddity about them. Calm, thought provoking, stately, image inducing with a purpose, the music from Julien Pontvianne is moving and elegant.